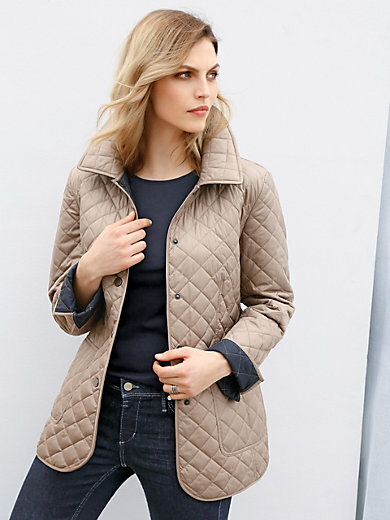 Quilted jacket by Peter Hahn. Casual yet sophisticated, city chic jacket for mid-season wear. In flatly padded microfibre with a contrast coloured inside. Elaborately fashioned with sandwich quilting. Stitched through, shape-retaining outer fabric, filling and lining. With press stud fasteners, 2 patched side slash pockets and sleeve vents. Made of 100% polyester. Lining 100% polyester. Length approx. 28ins. The coat is machine washable. Jacket is rated 5.0 out of 5 by 2. Rated 5 out of 5 by bookworm from Beautiful jacket A smart, useful jacket. It is flattering and comfortable to wear. Risked buying size 16 (although wanted a 14 which was unavailable) and so glad I did as the jacket is a great fit and slightly tailored. Delighted and also love the colour, more practical mushroom than putty I would say!